Since September, the city and university have been collaborating on projects exploring topics ranging from a public/private business incubator and smart buildings to food truck permitting and neighborhood planning. All of the projects advance City Council Vision priorities. Known as a “City in a Park” with nearly 100 parks and a vast network of trails and greenbelts, Bellevue is the fifth largest city in Washington state. The Eastside city spans 33.5 square miles from Lake Washington to Lake Sammamish. As part of the Innovation Triangle, Bellevue is the high-tech and retail center with a downtown skyline of gleaming high-rises, a diverse population of approximately 140,000 and schools that are consistently rated among the best in the country. 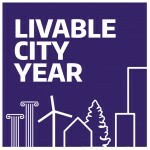 To learn more about why Bellevue is the city where you want to be, visit bellevuewa.gov. 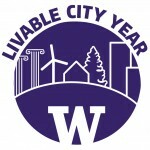 The Livable City Year program launched in 2016 in collaboration with UW Sustainability and Urban@UW, and with foundational support from the UW College of Built Environments, the Department of Urban Design and Planning, UW Undergraduate Academic Affairs and the Association of Washington Cities.